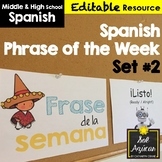 Students race to conjugate as many Spanish verbs as they can with these conjugation race worksheets. 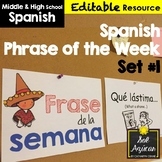 You pick the verb(s) and the tense, they do the conjugating. 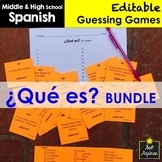 Unlike my other Minuto Loco products, this listing is in word format and is EDITABLE! 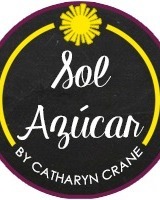 Ask Sol Azucar By Catharyn Crane a question. They will receive an automated email and will return to answer you as soon as possible. Please Login to ask your question. 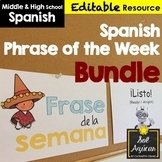 I taught High School Spanish at a large Title 1 public school for 6 years and served as my school's staff development coordinator for 2 years. I believe that people learn by doing, and language students learn by reading, listening, writing, and speaking in the target language. As a teacher, I act as a faciliator of students' active learning-- using engaging, relevant collaborative activities. I come from family of teachers and believe strongly that like Mandela said, "Education is the most powerful weapon which you can use to change the world". I learned Spanish growing up in Phoenix, and studying in Spain and Chile. I've gotten to work, volunteer, and travel all over the Spanish-speaking world, most notably teaching at a bilingual elementary school in Honduras. I blog at www.SolAzucar.com and www.SecondarySpanishSpace.com. Follow me by clicking on the links below!